"... those roles which, being neither those of Hero or Heroine, Confidante or Villain, but which were nonetheless essential to bring about the recognition or the denouement, were called the Fifth Business in drama..."
"... opera companies organized according to the old style; the player who acted these parts was often reffered to as Fifth Business. These quotes from William Robertson Davies' brilliant and best-known novel, the first in the Deptford Trilogy, describe its premise. Dunstable "Dunny" Ramsey begins his life story as he ducks to avoid a snowball thrown by his boyhood friend Percy Boy Staunton. It hits a young woman and precipitates the premature birth of Paul Dempsey. At once, both Dunny and the event are established as "Fifth Business". Dunny's guilt-induced relationship with the singular Mrs Dempsey sees her apparent decline into madness... or sainthood. Robertson Davies then explores how a saint would be received in a small town in Ontario in the early years of the 20th century. Paul, Percy and Dunny's lives remain intricately intertwined, leading Dunny to Europe, Percy to wealth and status, and Paul to run away with a travelling circus. Jungian archetypes, faultless, wryly humourous prose, erudition, magic and mythology characterize this Canadian masterpiece. 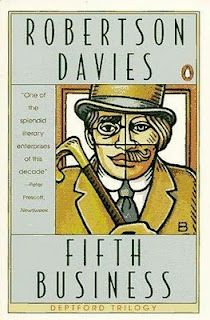 First published by Macmillan of Canada in 1970, Fifth Business was selected 40th on the American Modern Library's "reader's list" of the 100 best novels of the 20th century. 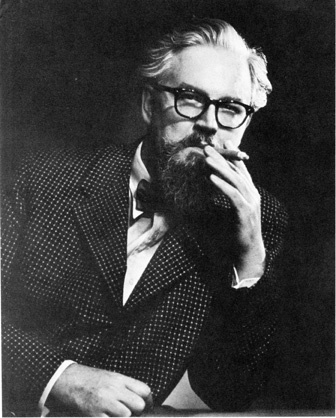 William Robertson Davies, (born August 28, 1913 - December 2, 1995) was a Canadian novelist, playwright, critic, journalist, and professor. 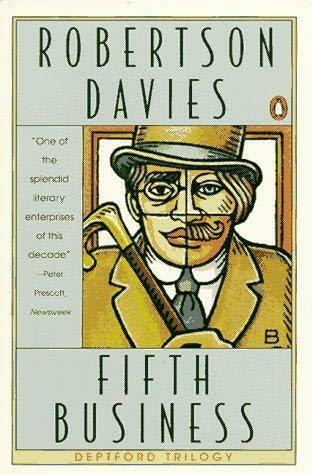 He was one of Canada's best-known and most popular authors, and one of its most distinguished "men of letters", a term Davies is variously said to have gladly accepted for himself and to have detested. Davies was the founding Master of Massey College, a graduate residential college associated with the University of Toronto.